Everyone I have ever met who is a truly devoted and passionate fan of 2-Tone and ska tends to have followed a similar path. Like alien abductees, we all remember in great clarity and detail that singular moment when we heard The Specials first album for the very first time. And almost to a person, I have noted that the lightning bolt 'religious' experience of hearing that record has stayed with us and shaped our lives. For me it was when a friend at school played me The Specials first album in late 1979 (I sat opened mouth and was actually a bit afraid!). I rushed out and bought my own copy and that started a regular routine every Friday after school when I haunted the local record store near my house. I pestered and annoyed the clerks there so much about The Specials that when they saw me coming they would suggest new records for me to buy. 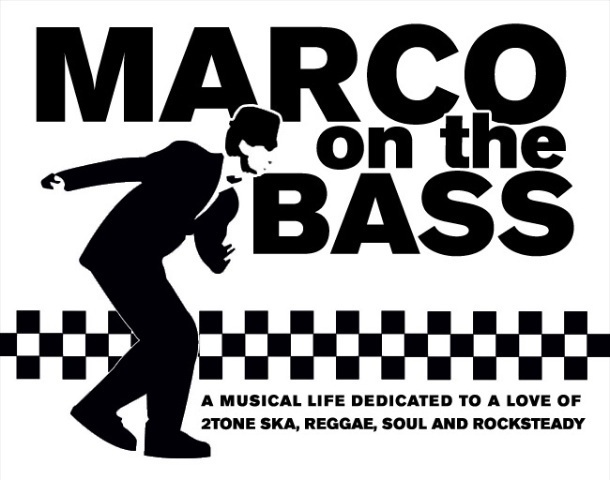 This was the start of my ska and 2-Tone education and it lead me to where I am today. Paul "Willo' Williams is a fellow traveler and 2-Tone devotee. He is best known for writing the book 'You're Wondering Now - A History of The Specials: From Conception To Reunion' which was re-published and updated in 2009 in conjunction with the band's 30th reunion tour. Though we lived thousands of miles part, our love of 2-Tone and the impact it has had on us throughout our lives is striking (in fact one of my favorite parts of the book is a section titled 'A Testament Of Youth' where Williams collects the personal stories from a number of people including Damon Albarn, Tricky, Gary 'Mani' Mounfield, Jake Burns and others about why The Specials really were so special). Williams first exposure to The Specials sent him on a path that has included being an author, promoter, commentator and lifelong fan of 2-Tone, ska music and British skinhead subculture. Williams love of ska and 2 Tone started in 1980, when at 13 years old he snuck out of his parents' home in York and travelled to nearby Bridlington, where he saw The Specials perform live. The event had a long-lasting and profound effect on him. In the 1990s, he created, wrote and distributed his own quarterly ska and 2 Tone fanzine 'Street Feeling' from his back room. In 1995, he wrote 'You're Wondering Now - A History of The Specials'. It received many favorable reviews, including three stars from "Q Magazine", and was used to compile the band history section on the official Specials website. The book is now a collectors' item. 'You're Wondering Now' was the first book to fully document The Specials history and it pays equal attention to the bands that followed their break up - Fun Boy Three, The Special AKA, JB's Allstars, The Colour Field, Vegas, and so on. The book also includes one of the most complete Specials discographies. 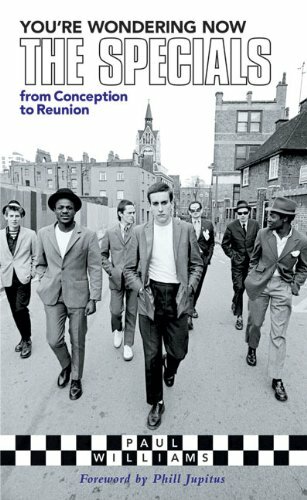 Would you like to win a FREE copy of 'You're Wondering Now - A History of The Specials: From Conception To Reunion'? Read the whole interview as the clue to the answer to the question is contained somewhere in the interview. More details on how to enter at the very bottom of the post. What has the reunion of The Specials meant to you personally and to a generation of fans (like me) who were just teens when the band emerged in 1979? On a personal level, its something I thought I'd never ever see in my lifetime. About 7 years or so ago, I got my first inkling of the guys talking and meeting. I was like a kid in a candy store! It was on, it was off. Jerry was in, Jerry wasn't in. it was a real roller coaster ride for a while. It was a case of just wait and see. Obviously Jerry not joining up took the shine off the matter at first, but I believe it took all 7 members to make the band what it was, so in the end 6 out of 7 was definitely going to do. Being at the concerts for the 2009 dates was unbelievable. The first date in Newcastle was the most emphatic and emotional gig Ive ever been to. Hearing 3,000 people singing in unison to 'Doesn't Make It Alright' - - you'd have to be dead not to be moved by it. The reunion from the very first tentative steps to now has been a joy for me. I think there have been thousands of people who never got see The Specials live originally and this reunion has given them that chance to get a taste of seeing these boys live. Its like a nuclear explosion going off 3 feet from your face! It has introduced so many younger people to the band which is definitely a good thing that will ensure the legacy continues over generations to come. Brilliant. 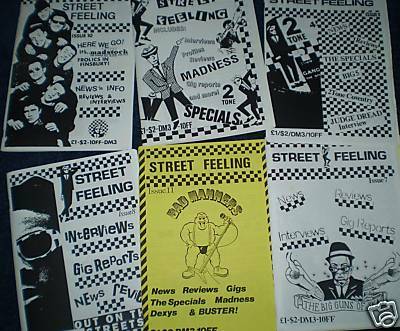 You've really helped to keep the flame for 2-Tone and The Specials burning for a long time through your fanzine 'Street Feeling'. Tell me a bit about how you got started with that and how difficult was it to publish and distribute in those pre-Internet days? Ah yes, my other baby! As you say I've always followed and promoted 2-Tone and its members careers over the quiet years and when the ska-boom of the late 80s here in the UK kicked off, it never really went away and we had a really buzzing underground community with plenty of gigs of quality acts to go and see. Fanzines started to crop up but were primarily aimed at the current scene. I wanted to do one that incorporated that but also harked back and rekindled any interest in the 2-Tone bands. It was a fun thing to do, really good. It was time consuming- cutting out rub-on transfer letter titles and headers and cutting up old articles and pics and glueing them in but I loved it. The text was hand typed on an old electric typewriter. I also teased people into buying it by giving away free gifts with each quarterly publication. I had always continued to collect after 2-Tone originally died away so I had a few bootleg tapes and stuff. That helped boost the mag but I couldnt have anticipated its appeal. It went through the roof, gained a huge subscription list and went all over the world. I remember going to the local library at the start of Street Feeling and using the photocopier to print it! 10p a copy! It cost me a small fortune and the queues behind me were immense! I used to make bulk trips to the post office to send them off. The project got me in touch with like minded people, some of them who are still very good friends today. I received great reviews from other Zines and magazines like Record Collector and Scootering. They were good times! I did a website version some time ago but with all my other commitments on the scene I couldnt find time to update. What inspired you to start writing 'You're Wondering Now' in 1995? Tell me about the research for writing the book? What was the bands impression of you and your plan to write a book? What struck me was that around that mid 90s we had had books on many ska artists including Madness, Bad Manners but nothing about The Specials and I wanted to put that right in some way. At that time, George Marshall was championing the whole skinhead/punk/ska/reggae/oi scene with his fantastic ST Publishing group. George placed an advert in his Skinhead Times newspaper to say if anyone had an idea for a book then to get in touch with him as he has started publishing books with of course, his "Two Tone Story", the first definitive book to cover the label. I had always written short stories and stuff and had already handwritten a bit of text as a kid! So I contacted him about doing The Specials book and as he was a fan he took me up on it. He was such an inspiration because of his enthusiasm for the project. He gave me John Bradbury's phone number to get me up and running and I remember phoning Brad, all very nervous, and when he answered I spouted a load of undecipherable crap. I couldnt get my words out and he hung up on me! I had to phone him back! We got chatting and Brad seemed up for it so we arranged an interview in London. From there I met Specials former manager Rick Rogers, and he gave me other contact numbers for Roddy and Horace and it went from there. My research came from memory, old articles from music mags, old video footage I trailed through and the interviews I put together. They all seemed cool about the book, after all, it was putting the band back into the highlight at a very quiet time for them. As for their impressions of me, well, I dont know. I would like to think it was all cool. Who was the real driving force behind the reunion at Bestival 2008? You were there to witness it as well. What was it like to see it all come to fruition? It must have been surreal? The whole Bestival thing was really exciting. Just to know they were that close to performing again really sent the pulse racing.It was also a chaotic time for us at The Specials forum so it must have been a thousand times worse for the band! It was leaked on the forum that the band were the "surprise act" at Bestival, and the organisers were in touch to get the posts off ASAP! It really had to be kept under wraps because thats what the band and festival organisers wanted and therefore that was the way it had to be but it was THE best gig I've been to. Bar none. It was something I had hoped against hope might happen for so long! I recall getting onto the side of the stage just as 'Gangsters' kicked in and I looked about and I really couldn't take it all in. I was a grown man but what I saw really brought a tear to my eye. Emotional? Surreal? Nothing can describe that day. As for the driving force? I'd say Lynval. That man is a great human and really notched up the air miles trying to keep things on course. Henry Kissinger of the group I think they call him! (See video below that Williams shot from the side of the Bestival stage). What is your take on Jerry Dammers? Do you think that he has any regrets about not playing any of the reunion shows (he watched from the crowd at Bestival)? Members of the band did say the door was always open for him right? Why do you think he's been so adamant about not participating? Jerry is a legend and a genius. Sheer class. Without him, we wouldn't have 2-Tone. We nearly fell over when we bumped into him at the Bestival entrance! It must have been really odd for him to witness the Bestival gig. Ultimately I think that the band's approach. To play the music as it was. They gave the fans that nostalgic experience they wanted then could look at making some new creations after that. I personally don't think that changing the arrangements would have worked and possibly may have turned a few people off. But saying that, it may not have gone that way. I dont know. Yeah, I believe the door was left open to Jerry, but people will always read other things in to that no matter how stern the band are about that statement being true. I think some of the band would like to record with Jerry one more time maybe, but its really a private inter-band matter. I think Jerry is adamant about not participating because he has said his piece and is sticking to his guns. His real drive is for his work on his Spatial AKA Orchestra so obviously being the mover and shaker he is, he wants to move on musically and who can blame him? If you listen to 'More Specials' and then 'In The Studio', it is possible to maybe hear that the vision he has now of his Orchestra project grew from that base. I do however, feel that he must have a tinge of regret after the success of the reunion shows. It would be a normal emotion and reaction I think. 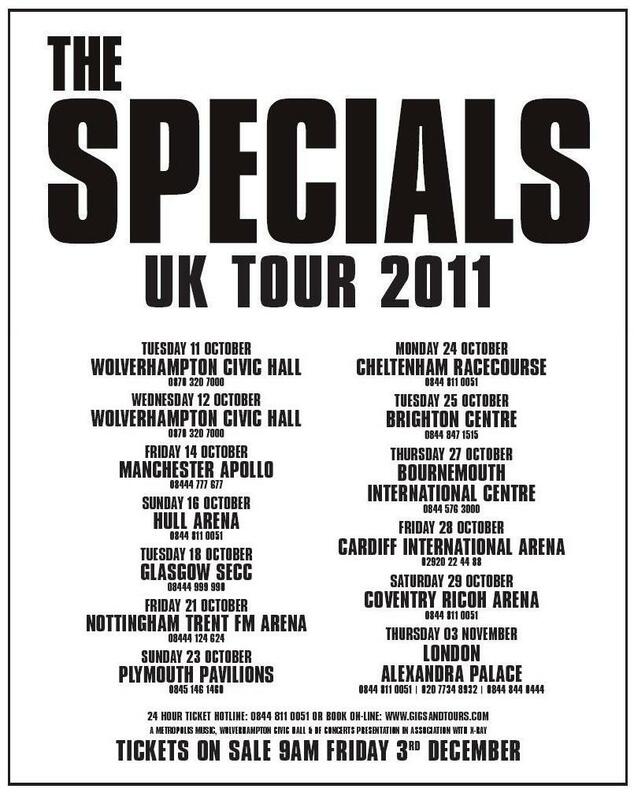 There were rumors following The Specials 2009 UK tour that the band would return to the studio and record new material. Ultimately that hasn't happened. Why? Well, this would always be the toughie wouldnt it? People say a second album is "the difficult" album but to say that recording new material would be difficult is an understatement. Whatever the band were to do, it would have to be 150% perfect. No doubt at all. It would have to be a masterpiece because it would be tested against the first two Specials albums and also against Jerry Dammers' absence. A new album from these boys would take a very long time to produce. I dont think its something they could just return from out in the cold for 30 years and carry on where they left off and knock up in six months. If it happens then great. The music scene will be buzzing about it. If it doesn't arise then fair play to them. Its a huge undertaking even with superb songwriters in the outfit. One of the guys once said to me it was easy to write 30 years ago as they were angry young men but what would they write about now as largly contented adults? We wouldn't want a band like The Specials to record songs about paying your mortgage and going to buy a paper would we? My impression is that the six members of the band who are part of the reunion seem mostly unified despite some grumblings from Roddy Byers on The Specials fan site. How did the band manage during their 2010 European festival tour? I think in general they had a good time. If you read Horace Panter's diaries on The Specials website that pretty much says it all. They flew in. Performed and came home. A very quick and professional turnaround. They are six very different characters and thats what makes the band what it is and they all know this and its par for the course, part of being The Specials. The 2011 tour dates do not include any American dates. How much of that has to do with issues related to Neville's U.S. visa? Will we see the band visit here this summer or fall? The band have announced that this 2011 tour will be the end of the reunion. Do you think they have taken the reunion as far as they can? Is this really the end? Has writing the book given you a different perspective on the band and its reunion? Yes it has. Having had an insight into what has gone on behind the scenes has changed my perspective, but not in any negative way. They say dont get to know your idols because you will be disappointed, but this has certainly not been the case, and I hope I have formed some true friendships that will endure. 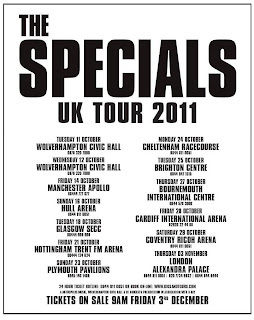 Its a very complex band - not one for the faint hearted- and they deeply believe in the Specials legacy. Yes, there have been various incarnations of the group at times in different shapes and forms but when it all comes to a head, they do believe in the tunes and the messages they contain. The reunion was a long winding road full of one way streets and cul-de-sacs but they got to their destination eventually. The reaction on tour was phenomenal. The experiences have been out of this world. Life in The Specials can be fraught, but it is a wonderful thing that they are all part of and very proud of including Jerry. Without a doubt it has been one of the most successful and controversial reunions ever seen. Its had everything! Its been worth burning that flame for all those years and Ill do it for another 30 years plus God willing. Good luck to em all! You can purchase a copy of 'You're Wondering Now - The Specials: From Conception To Reunion' from Cherry Red Records and Amazon in the U.S. and Amazon in the U.K. To win a FREE copy of Williams book, have a listen to the song that Lynval is playing in the beginning of the video above and send me its title in an e-mail or post a comment (and include your e-mail address) below or on the MOTB Facebook page. I'll pick one winner (who will need to cover the cost of postage) on April 1st. GOOD LUCK! holiday fortnight is the answer to that one mate! thanks for answering my Bonds question! The song is Holiday Fortnight that Lynval is playing. ps : great zine marco ! !